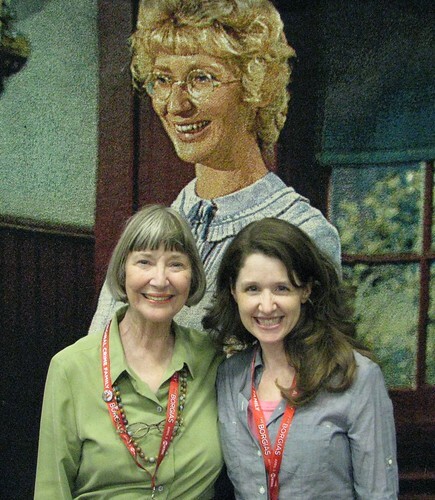 Jennifer of As Cozy as Spring has me cracking up over her take on Pa Ingalls this morning. Me: "What will we eat?" The conversation continues. Too funny. And I’m so with you, Jenn. As a child, I always thought Ma was a bit cold. The Ma of the books, that is, as compared to the smiling-eyed Ma on TV. In the books, it seemed like no matter what Pa did, no matter how narrow the escape or how great the accomplishment, Ma’s response was always just "Oh, Charles." My heart was with Pa of the grand gesture, the wanderlust, the thirst for adventure. I scoffed along with Laura at the quiet, settled types who were unaccountably reluctant to hit the trail again. And then I had kids. The end of Little House on the Prairie gives me such a pang, now. Caroline had just gotten her garden going. It tore me up to leave behind my berries and butterflies in Virginia. Imagine if that garden was one of your primary food sources and you’d worked your tail off to get your carefully guarded seeds into the ground! And now you find out the house is three miles on the wrong side of the line, three miles. Jenn’s take on that scene is dead on. Caroline Quiner Ingalls, I give you much more props now that I’m a mama too. I was so worried about offending Little House fans with that post. Of course, I love the books and the love between the husband and wife is obvious, but I can’t help thinking how hard it must have been for her. I have always admired Ma – more so now as a wife and mom. I never thought of her as cold, though. More like gentle, caring and soooo trusting of Pa. She has actually been that elusive Proverbs 31 woman, IMO. But I actually kind of liked Pa’s daring manliness, too. Not saying I’d want to be his wife though!! I’ve always wondered about Ma and the way she’s able to accept such major changes with a simple ‘Oh Charles.’ When did marriage change so dramatically to a partnership?